Draft: 2015, Atlanta Braves, 1st rd. Selected by the Atlanta Braves in the first round (28th overall) of the 2015 First-Year Player Draft. 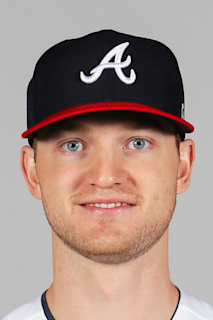 Made his major league debut and went 2-1 with a 3.51 ERA (10 ER/25.2 IP) and 21 strikeouts in five starts for Atlanta...Also missed time after two different disabled list trips for a right shoulder strain, with the second one ending his season early in June ... Had his contract selected from Triple-A Gwinnett on 5/1 and made his major league debut that night at New York (NL)… Made his major league debut at the age of 20 years, 270 days...Was the youngest pitcher to make his debut in a start for Atlanta since RH Julio Teheran debuted at 20 years, 100 days on 5/7/11 ... At the time of his debut, only five starting pitchers had debuted for Atlanta at a younger age than Soroka - Charlie Vaughan (18 years, 332 days - 9/3/66), Mike McQueen (19 years, 033 days - 10/2/69), Steve Avery (20 years, 060 days - 6/13/90), Teheran and Al Santorini (20 years, 114 days - 9/10/68) ... Soroka was the youngest starter in the majors to make his debut since Julio Urías did so at the age of 19 years, 289 days for the Los Angeles Dodgers on 5/27/16 ... Bryse Wilson debuted for Atlanta at a younger age than Soroka later in the 2018 season ... Earned the win in his debut after allowing just six hits and one run over 6.0 innings, 5/1 at NYM...He fanned five in Atlanta's 3-2 win ... Won his debut at the age of 20 years, 270 days, becoming the youngest Braves pitcher to win his debut since LHP Charlie Vaughan beat Houston in game one of a doubleheader on 9/3/66 ... Soroka beat the NL East-leading New York Mets...The last time a pitcher as youngas Soroka won his major league debut against a team in first place at the time was 1997, when the Dodgers' Dennys Reyes beat the San Francisco Giants on 7/13...Reyes was 20 years, 85 days at the time, while the Giants were 52-39 and leading the NL West by four games over the Dodgers ... Needed just 80 pitches to complete his 6.0 innings, becoming just the second Braves pitcher to go that long in as few pitches during his major league debut... RHP Ryan Weber went 6.0 innings in 74 pitches on 9/8/15 ... Was placed on Atlanta's disabled list on 5/14 and missed 24 games with a right shoulder strain… Was reinstated on 6/13 after a rehabilitation assignment to Single-A Rome and Triple-A Gwinnett ... Returned from the disabled list and held the Mets to one hit and one walk over 6.1 innings on 6/13 ... Carried a no-hitter into the seventh inning before Michael Conforto singled to lead off the inning ... At 20 years, 313 days, became the youngest pitcher in the franchise's modern era to allow only one hit or less in a start of any length…Since World War II, only 17 other major league pitchers aged 20 or younger have allowed one hit or less in a start of at least 6.1 innings ... Made his final start of the season on 6/19 at TOR…The Calgary, Alberta native became the youngest Canadian-born pitcher to ever pitch in Canada at 20 years, 319 days...The previous youngest was MIL's Barry Cort, a Toronto native, who started on 5/3/77 vs. the Blue Jays at the age of 21 years, 18 days ... Was placed on the 10-day disabled list on 6/20 (right shoulder inflammation) and missed the remainder of the season…Was transferred to the 60-day disabled list on 6/27 ... Went 2-1 with a 1.76 ERA (6 ER/30.2 IP) in six starts at the minor league level ... Became the youngest Opening Day starter in the 10-year history of Gwinnett's franchise...Soroka (20 years, 8 months, 2 days) was nearly two years younger than the previous youngest, RHP Tommy Hanson (22 years, 7 months, 12 days), who pitched the inaugural game in Gwinnett history, 4/9/09. Spent the season at Double-A Mississippi, earning Southern League Mid-Season All-Star honors...Also named the Braves' organizational Pitcher of the Year...Was over five years younger than the average SL pitcher...His 11 wins tied for the fourth most in the SL and were the second most among Atlanta minor leaguers...He finished second in the SL with a 2.75 ERA (47 ER/153.2 IP), fourth with 153.2 innings and third with a 1.09 WHIP...His 153.2 innings were the most by a Braves minor leaguer...Fanned double digits twice, including a season- high 12 over 7.0 innings on 7/18 vs. Biloxi...Had nine starts in which he did not walk a batter...As a reference, only seven MLB pitchers had at least nine starts in 2017 with no walks...Compiled a seven-game winning streak over an eight-start stretch, 5/12-6/24...Pitched to a 1.40 ERA (8 ER/51.1 IP) over his run. Spent his first full professional season with Single-A Rome...Ended the year in the Top 10 among Atlanta farmhands (min. 75.0 IP) in wins (T3rd, 9), strikeout-to-walk ratio (3rd, 3.91), WHIP (T4th, 1.133), innings (5th, 143.0), walks per 9.0 innings (5th, 2.0), ERA (6th, 3.02) and strikeouts (8th, 125)...Went 7-0 over his last eight starts, pitching to a 2.39 ERA (13 ER/49.0 IP) and fanning 44 from 7/20-8/31...Made a pair of postseason starts and allowed just one earned run over 14.2 innings (0.61 ERA), as Rome won the SAL championship...Named a South Atlantic League All-Star and tossed 1.0 perfect inning with one strikeout in the South Division's 2-1 loss in the contest...Earned his first professional win in his seventh start of the season and the 17th outing of his career, tossing 5.2 one-hit innings with zero runs and five strikeouts. Split his first professional season between the GCL Braves and rookie-level Danville, combining to go 0-2 with a 3.18 ERA (12 ER/34.0), walking just five batters and fanning 37...His rate of 7.40 SO/BB was second best among Braves farmhands (min. 20.0 IP)...Held right-handed batters to a .119 (8-for-67) average. 18 de abril de 2019 Atlanta Braves llamado RHP Mike Soroka de Gwinnett Stripers. 20 de marzo de 2019 Atlanta Braves opcionado RHP Mike Soroka para Gwinnett Stripers. 31 de octubre de 2018 Mike Soroka estado en la lista cambian a por Atlanta Braves. 27 de junio de 2018 Atlanta Braves transferido RHP Mike Soroka de la 10-d&iacute;a lista de deshabilitado a la 60-d&iacute;a lista de deshabilitado. Right shoulder inflammation. 22 de junio de 2018 Atlanta Braves ponen a RHP Mike Soroka on the 10-d&iacute;a lista de deshabilitado retroactivo al June 20, 2018. Right shoulder inflammation. 13 de junio de 2018 Atlanta Braves activan a RHP Mike Soroka de la 10-d&iacute;a lista de deshabilitado. 5 de junio de 2018 Atlanta Braves envian a RHP Mike Soroka una asignaci&oacute;n de rehabilitaci&oacute;n a Gwinnett Stripers. 30 de mayo de 2018 Atlanta Braves envian a RHP Mike Soroka una asignaci&oacute;n de rehabilitaci&oacute;n a Rome Braves. 17 de mayo de 2018 Atlanta Braves ponen a RHP Mike Soroka on the 10-d&iacute;a lista de deshabilitado retroactivo al May 14, 2018. Right shoulder strain. 1 de mayo de 2018 Atlanta Braves seleccionado el contrato de RHP Mike Soroka de Gwinnett Stripers. 5 de abril de 2018 RHP Mike Soroka asignado a Gwinnett Stripers. 26 de enero de 2018 Atlanta Braves invitado fuera del roster RHP Mike Soroka para spring training. 4 de abril de 2017 RHP Mike Soroka asignado a Mississippi Braves de Rome Braves. 4 de abril de 2016 RHP Mike Soroka asignado a Rome Braves de GCL Braves. 1 de septiembre de 2015 RHP Mike Soroka asignado a GCL Braves de Danville Braves. 28 de julio de 2015 RHP Mike Soroka asignado a Danville Braves de GCL Braves. 8 de julio de 2015 RHP Mike Soroka asignado a GCL Braves. 7 de julio de 2015 Atlanta Braves firmado RHP Mike Soroka.